I took these images from inside my house through a window, so they appear softer than the photos I would get if I was outside with the birds, like the last post. Shooting through a window is NOT a great way to photograph, because the glass distorts the image a bit. Many of the images were taken while it was snowing outside too. They are the softest, but the ones I like the most. 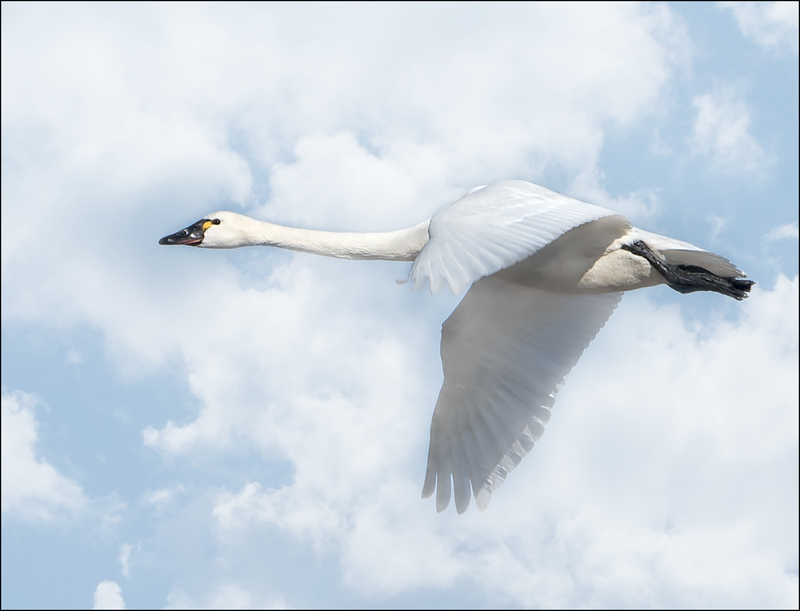 None of the images are as good as the shots I take at Niagara Falls State Park, but then again, it is more difficult to get birds in flight in the field. I do have some of gulls, ducks and geese coming up later though. And boy was it cold outside. I was freezing taking images beside the raging Niagara River. If I were a professional photographer, you would not hear the complaining, nor would a pro sit perched on top of the powder room vanity shooting out a window at an angle, hence the soft look to the images. Hey, ya do whatcha gotta do. Some are grainy because I had the ISO set to 1200 then to 3200 which helped in getting a suitable shutter speed, but also because it was very stormy out and not very bright out. The aperture was open at f5.6 and the shutter speed was about 1/1000. I did change them in some images. The camera I was using is a Nikon 7000 and it can take 6 frames per second. 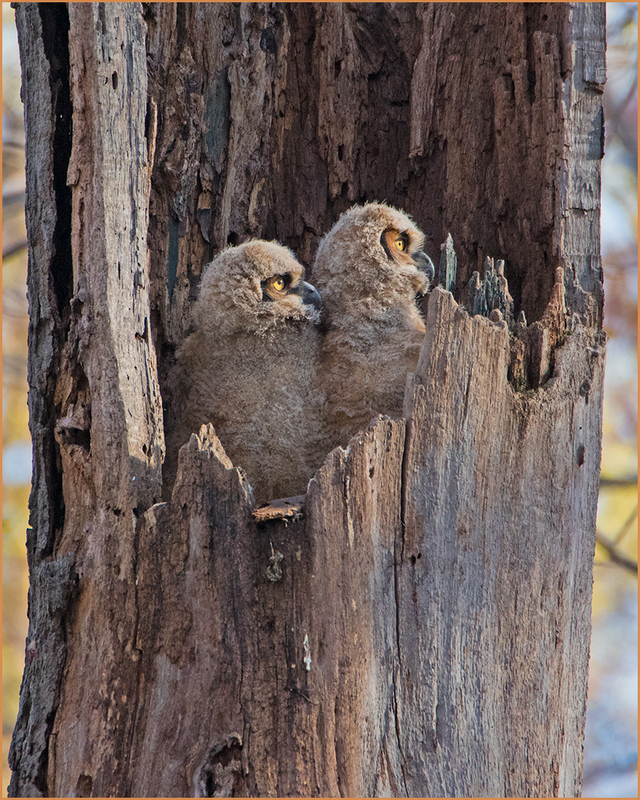 The lens for these photos was the 300mm. I did not change my position, so you can see how I zoomed in and out. I was using the Shutter Priority mode, where I select the shutter speed and the camera selects the aperture. I get to focus the camera and set the ISO also. I was asked the question of what camera I used for my last post on ducks, so I am using this post to answer. I kinda anticipated the next question of the camera settings so I thought to mention them too. The camera was on a monopod to keep it steady for this photo shoot. 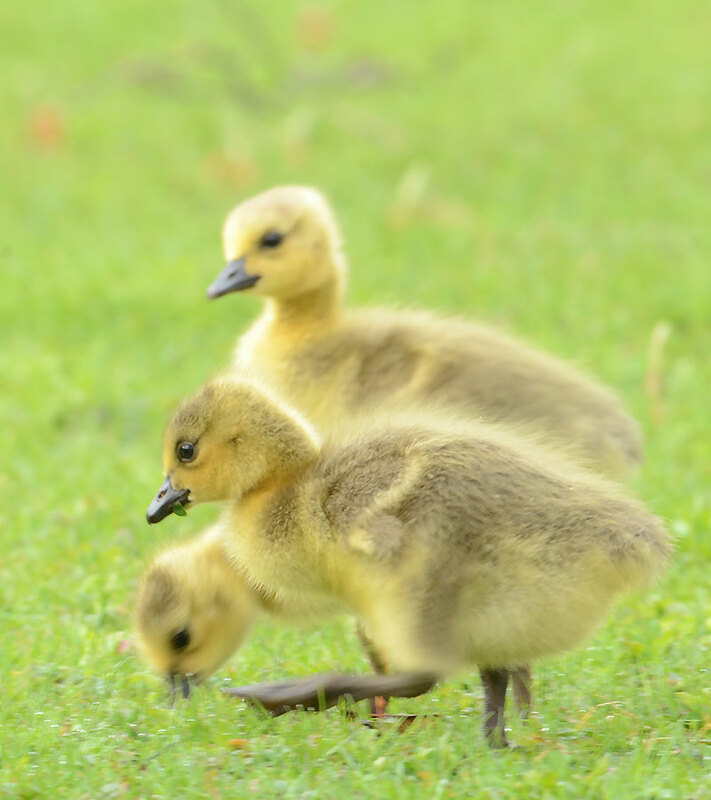 Most of my outside images are taken without a tripod or monopod like that of the ducks and geese. Hope you like the sparrow aerobatics. Notice their faces. Some really have mad expressions. A trick to getting many birds in focus is getting them sort of in the same plane, have a wider depth of field too by shortening the focal length of the zoom. That is why a feeder is a great place to practice. They all get in the relative proximity to one another. Since they are moving, it is easy to get many blurred. Below, they are all pretty well focused. 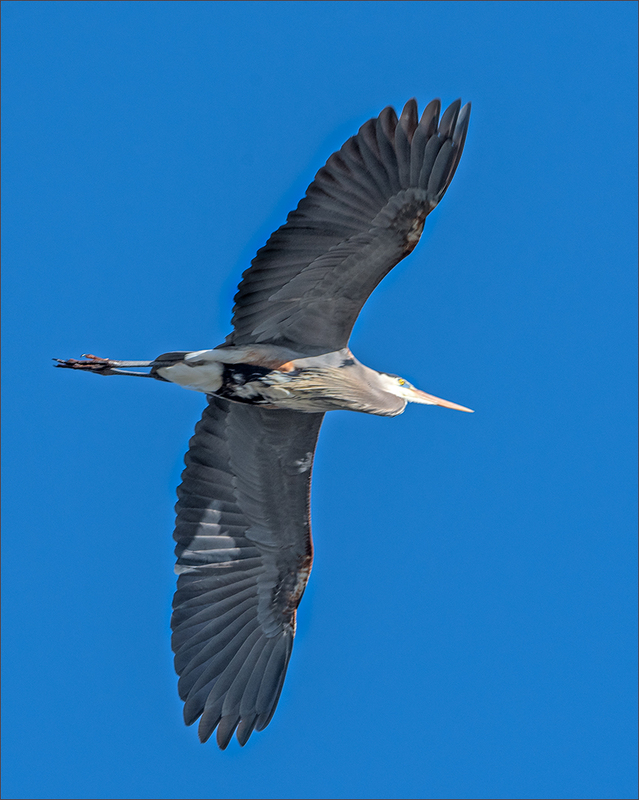 I am only learning to get good images of birds in flight. I practiced on seagulls and they were great subjects. The images were clear and had good depth of color too. If you wondered what is in the feeder, it is hulled sunflower seed. The feeder a few images below has niger seed. At the Falls, I throw out corn, peanuts and sunflower seed in the shell. I have been amazed watching the birds de-shell the peanuts. I never knew so many birds can do this. My cockatoo is a master, but these little birds really work at it. Cardinal alert!!! All Sparrows to the trees. I just love the image below when they all took off at once. This entry was posted in Birds, Nature, photos and tagged Birds, Birds in flight, Cardinal, nature, photos, Sparrows. Bookmark the permalink. These are wonderful pictures! Very inspiring – I need to hang a bird feeder out my office window (and wash the window). You’re a great photographer – I always look forward to seeing what you will post next! Thanks Malinda. Your idea right outside the window is good for getting closeups. I can not move my feeder in closer because I paved to the house. I tried the window outside my office out front and could not get any birds. I guess they did not feel safe. Donna, these are amazing! The photographs are wonderfully soft and of course the subjects are enchanting! Thank you. The softness kinda fits their dance. Just amazing photos. Love the cardinal shot with the spread wings! And I thought trying to get a photo of a butterfly with open wings was tough! I would love to see a video of you perched on the vanity at odd contortions taking photos! It was all worth it to get these great pics! The cardinal was a fluke really. They rarely perch on the feeder. I just happened to see him when he was leaving. Or should I say, he saw me then decided to leave. That is the way it always works. I know, a video would have been funny. The counter is only 18″ wide, not the standard 24″ too. That is why I used the monopod, more because I could not get comfortable and was always getting camera shake. The cardinal was taken without the monopod too. Whether you say you are not a professional photographer, to me you are! And even if you say these photos are too soft, to me they are gorgeous. Maybe that’s partly because i cannot take bird photos, either lack of skill or lack of equipment, or both. Happy shooting. You are too kind. Just practice a bit Andrea. Like I said below to Donna, some of my better photos were taken with a lesser camera. Heck, my best sunset was taken with my iPhone. You clever girl you – I love the sparrows ballet – and your lantern feeder. Thank you, Elaine. The sparrows were happy to perform. Curtain call is every morning about 8 AM. Donna, I love this bird-ballet! I love to shoot through a glass, I love distortions and reflections and the many layers you can have, is another explanation of the world. The softness applies very well to your photos because your are offering your vision of birds, I feel it is not documenting but capturing the essence of flying, keeping up in the air, and the snow was a plus! These are just superb. I would have been happy to have one shot like that. Your patience paid off. The birds must have been really hungry. Usually at my feeder they are polite and come one at a time. 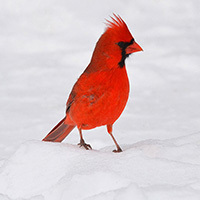 The jays and the cardinals are large and hog the space pushing out the smaller birds. Then the squirrels come and scare away everyone. Robins are about but never seem to have interest in the feeder. Woodpeckers are the most shy of all. Your capture of the birds in flight was a true feat! Thank you Victor, such high praise. I always come to your blog to get my fill of beautiful and varied imagery. I learn so much from seeing your work. I doubt I will ever get a flight photo as good as your puffin, it was Nat Geo worthy. It is funny, in my yard, all the birds are there feeding along with the squirrels. They rarely stay if I am the one out there. Part of the problem is my planting. I have so many tall junipers and arbs that they have so many places to disappear. I come out, and everybody heads for the trees and safety. They are very wary because my yard gets a lot of hawks being next to the gorge. At the Falls, ironically, this problem is much, much less, and the birds just hang around with me right in there with them. Yesterday, a feral city cat came and the feeder became birdless. The cat took off, sparrow in mouth too. I know they have to eat, but all the neighbors feed them cat chow, so they do it for the sport. I could watch the birds all day – and your post is almost as good as sitting at the window myself! I love watching birds and never thought I would. It takes patience and that I have little. I think that is why I have been trying to get better at photographing them because I like to snap and go. I could never just sit and wait for them like bird watchers. I get antsy around fifteen minutes with nothing happening. Donna, These are wonderful captures of birds in flight! Thank you for sharing them and the techniques too. No real techniques, just a few settings, One. Thank you for the kind words. I learned the techniques in the gull post. Galen is such a good teacher. He has a new post and his subject is baby sheep. So cute…. What a lovely ballet, your little dancers have been well trained. (tee hee) They certainly can be the bright spot in a rather dreary Winter, can’t they?! So true Carolyn. It has been an odd year without much snow, so gray and rainy this winter so far. Oddly, the first four days in January were sunny at least part of the day. Yesterday morning when I was out filling the feeder, I was out without a coat. Later, it got bitter cold. Wonderful, intriguing photos! My favorite (we’re voting, right?) is the third one down for its stop-action and bokeh. And the cardinal picture is priceless for the same reasons, but has the added punch of the cardinal’s fancy color. These were great. Looking at these makes me want to fly. So funny these were your favorites because I almost did not use them. I took so many just like this, really zoomed in, but the problem was I could not keep the camera steady enough even on a monopod. The least bit of movement gives the camera shake and they get out of sharp focus. It kinda defeats it when you are trying to stop motion in the subject too! I have a wireless shutter release too which would at least take me out of the equation depressing the shutter. I guess I would recommend that if you use a tripod. You can stand away from the camera and not disturb the birds as much, even inside. I bother them from the window too. But this only works in situations like this, where the camera is focused on a point and they come to that spot. The only fear I have to this is the birds might perch on the camera if it is outside. Hi Donna – Once again I am in awe of your photographic skills. As a proud owner of a new Canon Rebel T3i, I am excited to see the settings your provided. Am sitting here right now with my camera beside me trying to figure out the settings you used. The tutorial was really helpful. Heather, the weather conditions play into your setting. The consistent one is the shutter speed. I used between 1/500 and 1/1000 mostly. The 1/500 gives the airy feel to the wings, like they are floating. The 1/1000 and 1/1200 gives the crisper detail. 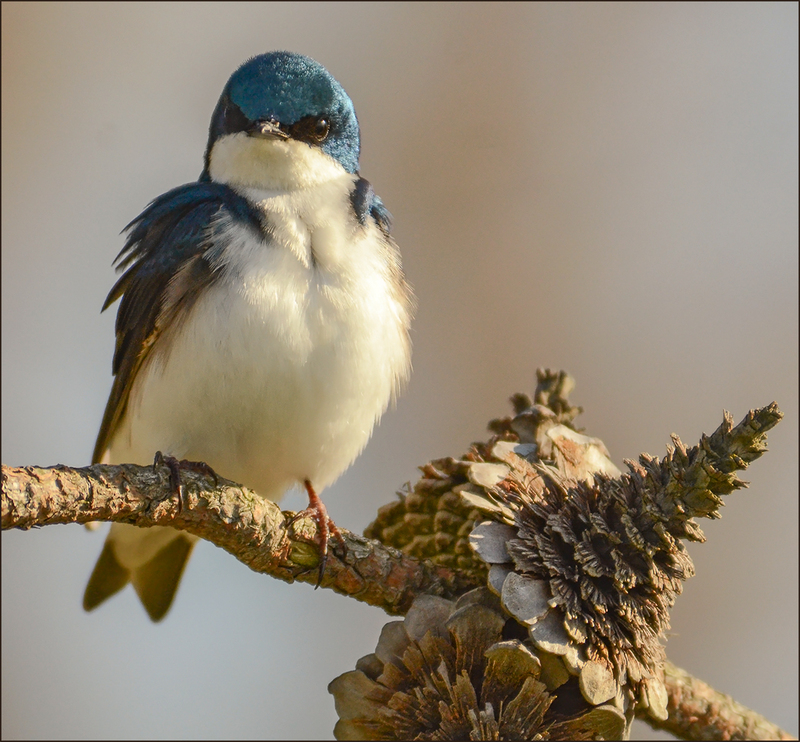 If you are new to shooting birds flying, start out with a flexible Program Mode or the shutter Priority Mode. I am not sure what Canon calls these modes but I know they have something similar. The reason I suggest them is if you jump to full manual, it is really frustrating. In these modes, not everything is under your control, so you have less to think about. I do shoot manual mostly, but have many images that go to the trash. You have to know your camera inside and out to be consistent. I am nowhere near there yet. Another thing, you might have an automatic setting for Sport. That works pretty good, but you find if you cannot control focusing, and sensor position, you get a lot of blurred images. The Sport setting is supposed to account for the motion and focus well, but that is not always the case. Since you are usually panning, sometimes it takes the camera too long to focus and by then your subject has just left the frame. I certainly cannot offer the best advice, but I can tell you how I am learning, by mistakes, trial and error and just fooling around with the camera. All the training I did have, which was mostly darkroom and composition stuff, is nothing compared to learning by doing, over and over. Plus, I get good advice by blog hopping too. I have a couple of good photographers listed in my sidebar. Cute post, Donna;-) I have the exact same feeder and fill it with hulled sunflower nuts, as well. I don’t tend to get sparrows, though…I get a lot of finches here, as well as cardinals and bluebirds. I have photos somewhere on my blog, from other years, that look similar to yours;-) I have kind of stopped photographing these activities as I’ve been watching them for years. Although I never tire of watching I have gotten lazy about photographing and blog posting! I have a new intention of starting this up again and being more active on the blog…so hopefully you’ll see more of me at some point soon;-) Sometimes it feels as if I’m blogging about the same thing, over and over, and I guess I just got tired of showing the same things. But it is fun, and there is really no limit to sharing what goes on in the garden! Happy New Year to you! Great photos – especially through a window!!!! How funny that they all took off when the cardinal arrived! 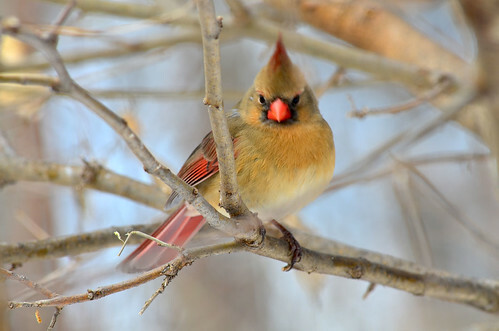 Actually, the cardinals really do not bother the sparrows. The sparrows are an army strong, but cats come into the yard and they scatter pretty quick. I am glad you liked the little dancers. Really clever Donna – I’ve never seen photos of garden birds like this before. Thanks for sharing your technique. Sparrows are easy to photograph like this because there are so many of them. I was a little disappointed I did not get them fighting each other. That is pretty funny too. You did a great job capturing these antics. I have been trying to get some photos of the birds crowding each other out from the feeders, but it is not easy. I particularly like the one of the bird in flight in the snowfall…lovely! Happy new year! Put your camera on burst if it has that feature. You will be able to get some great images of them in sequence. I did not use it on mine, but did click pretty fast as they flew around the feeder. Happy New Year to you too! Looks like fun. I crack the door just a little, then wait for the birds to come back. Haven’t had as many this year. btw, happy new year. The birds in my garden are too wary because of the hawks and cats to crack the door. Any movement at all and they disperse. Sometimes, and rarely, they will visit the feeders when I am outside. At the Falls I do not have this problem because I photograph them in the heavy brush. I have seen the hawks overhead, but they can not get them here. Happy New Year, Greg! Such great pictures as always! I love watching the birds and taking photos, though my photos are not nearly as good. I’ve been reading a couple books, trying to understand the terminology and how to use my camera to the fullest extent. I really need to take a class on how to use it! Thank you Indie. I did take classes (a long time ago), and I found it is so much better to get the info from others having your same camera. I use the photo blogs quite a bit. There are so many that give advice, how to and technique. What I learned in college was very general and more design oriented. The camera itself was a lot of trial and error. I thought only superheroes could freeze time. Great shots! Thanks, Les. Your photography is one that I greatly admire. I love your use of good lighting and you are great at good composition too. I visit to learn from you. Wow, quite a show. I have a thing for birds so I really enjoyed these. Cardinals are my favorite birds so I really enjoyed that shot in particular. All fantastic pictures. Thank You for answering my question :-). I have a Nikon too. And, let me tell you most of your pictures are professional like only. The professionals have such crisp qualities because they use photoshopping on their raw-data pictures. Are those bird-feeders squirrrel proof? Most of my seeds are eaten by those fat squirrels. Wow! These are just amazing. I loved everyone of them. What a fun post. So cute with their little feet reaching out to land. These are incredible, Donna! It’s nice that you offer a combination of various techniques on your blog. And thanks for explaining your camera and its settings. I am terrible with moving subjects and I’m in awe of your talent. I had the same issue with the window glass on my squirrel post, but I thought if I went outside the squirrel might move from his perch. Great post! Birds at the feeding station pictured through the kitchen window, that does it for me Donna. I do like your professional touch of capturing them in flight. Smashing shots, Donna. I’ve been trying to take shots of birds on the feeders where I work but my camera only goes to ISO 1600 and six shots per second? Wow. I need to upgrade, sigh. Also, I generally use my camera (Nikon D60) on aperture priority to ensure a decent depth of field. Think I’ll try going with shutter speed priority and see what happens. Great post! I actually really like the soft look. It adds an artistic touch to these photos and makes their wings look like beautiful capes. Great shots! Aerial acrobatics at its best. Those photos are amazing–and what a beautiful subject!